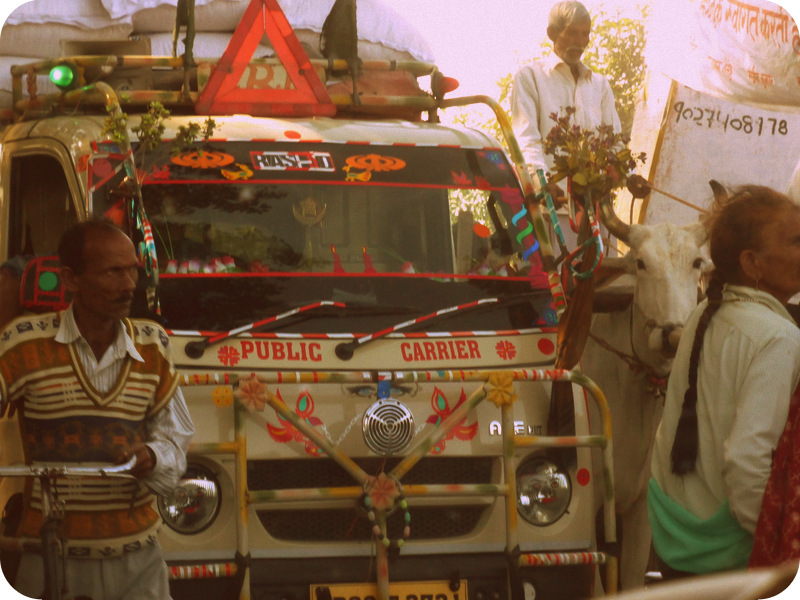 In mid-November, we visited India’s first National Park, named for British hunter-turned conservationist, Jim Corbett. The park was established near Corbett’s Indian home, in prime tiger country. Tigers, via the Indian government’s Tiger Project and the work of numerous NGO’s, receive the bulk of conservation funding in India. Perhaps that is fitting given that the animal is an Indian icon. However, the high level of tiger conservation funding and uncertain results, as well as a dust-up over governmental fudging of the tiger counts, have led to controversy in India. There were literally dozens of tiger researchers employed at the Wildlife Institute of India, my affiliate institution for the Fulbright-Nehru grant. The running joke among conservation biologists in India is about the great number of tiger researchers per individual tiger in India. 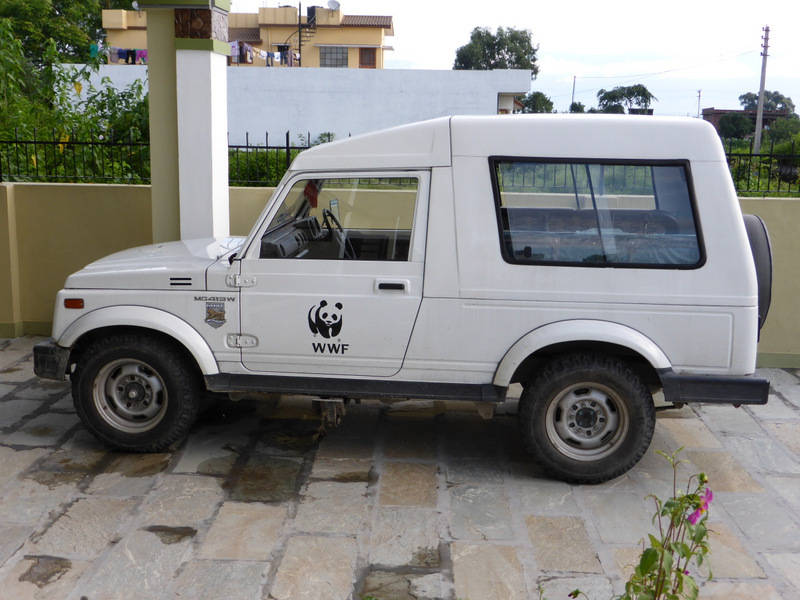 My next door neighbor in Dehradun is a tiger researcher, working for World Wildlife Fund, India, parking his logo-emblazoned jeep in our shared driveway. His wife, a recent Ph.D. graduate of the Wildlife Institute was working as a Senior Project Biologist for the Tiger Project. The tiger lab at the Wildlife Institute hired more than thirty new field assistants while I was at WII and seemed to be flush with high-technology equipment: remote cameras (“camera-traps”), radio-telemetry equipment and veterinary tools. While our neighbor and some of the other researchers were working locally, in the Rajaji National Park, adjacent to Dehradun and Rishikesh, the chances of seeing a tiger in Rajaji are extremely slim–the tiger population in Rajaji is estimated at 16 animals, roaming through a narrow sliver of park that forms a corridor leading to Corbett. 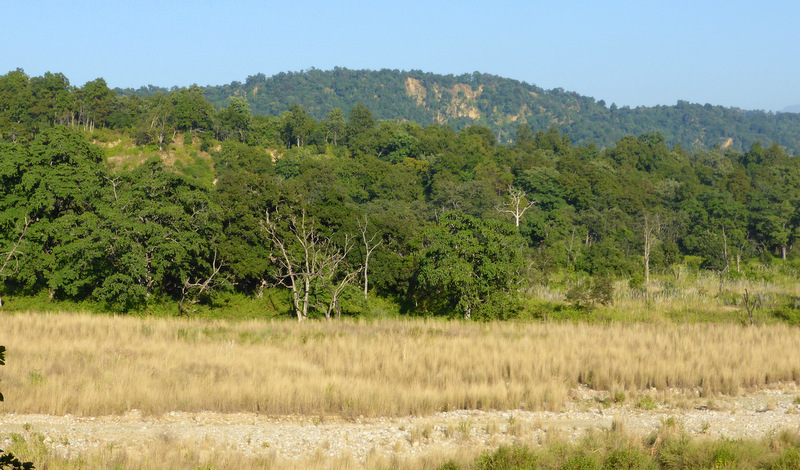 Rajaji forms an important area for the movement of tigers in Uttarkhand, and has just been designated a tiger reserve (May, 2013). But odds of seeing the iconic cat are greater in Corbett, home to the highest density of tigers in India: one cat per 100 square kilometers, an estimated 164 tigers in the park. 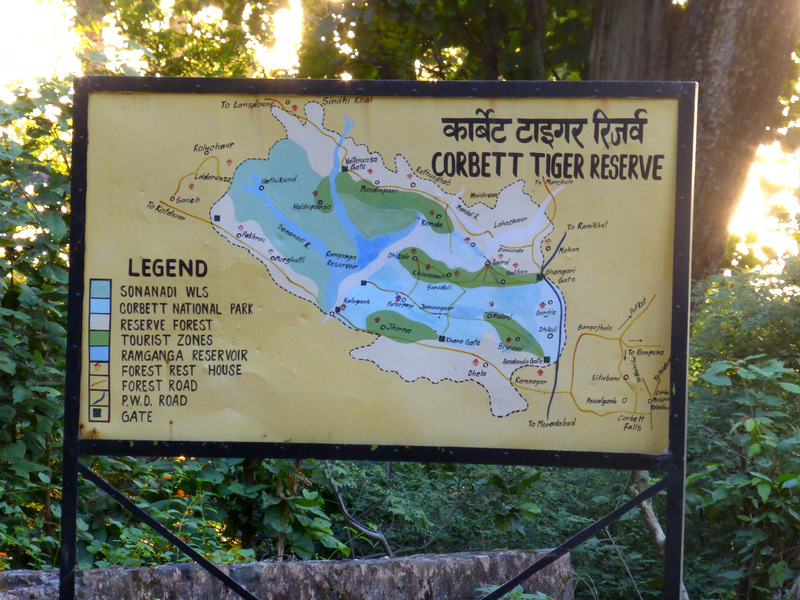 Corbett is in the Kumaon region of Uttarkhand, a dry forest, just south of the Himalayan foothills and a 6 hour drive East of Dehradun. In the post-monsoon season, many rivers in the park are just dry river beds, excellent for registering tiger tracks, pug marks. 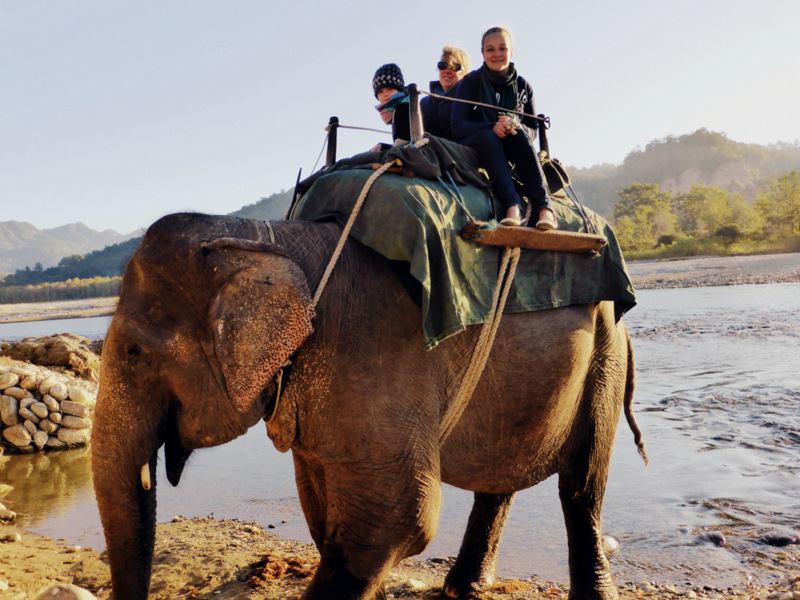 We crossed the Kosi River, the Southern boundary of the park, on elephant back, following the well-worn trail of many other elephant-riders, with an experienced mahout, searching for sign of tiger in the dry river beds. It wasn’t long until we found fresh tracks. 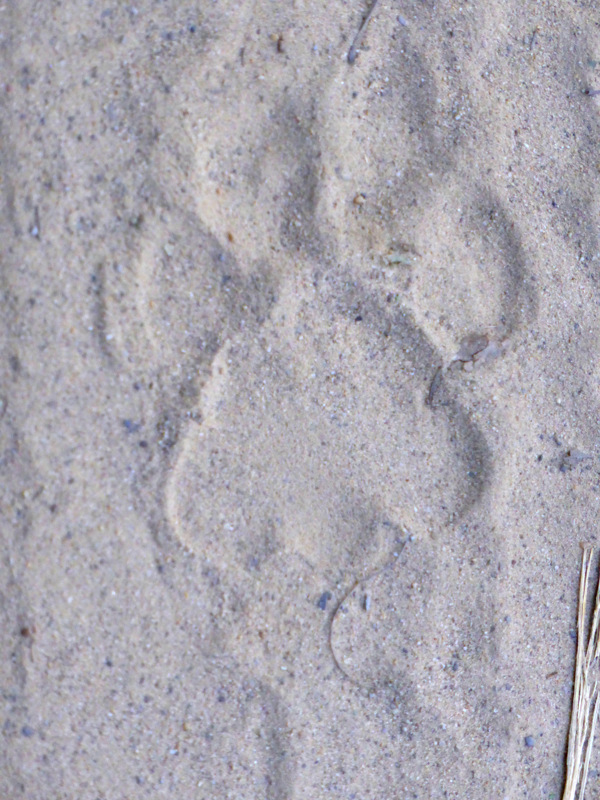 Unlike dog tracks, cat tracks have a leading toe, one toe out in front of the rest, and an M on the posterior side of the foot track. Nothing for size scale in the photo but a grapefruit would easily sit completely inside the boundaries of this track. At one point during our elephant safari, the elephant began to rumble, then trumpet. The mahout whacked it with his sugar cane motivating rod, and we pressed forward toward a sambar, an almost horse-sized deer, lying in the sand not far from the river, head torn away from body. Our elephant did not wish to linger near the tiger kill so I took no photo of the dead sambar, but the sambar below is one we saw in the park, from a jeep. This female was in the process of raising her tail as an alarm flag. 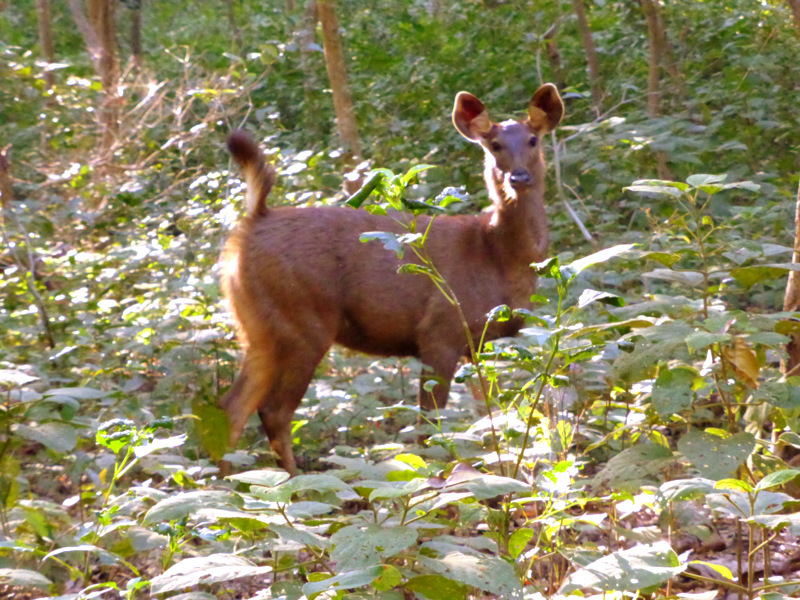 Besides sambar, chital, spotted deer, are a staple of the tiger’s diet in Uttarakhand. They must be constantly vigilant to survive. Their efforts are aided by a mutualistic partner, the langur. 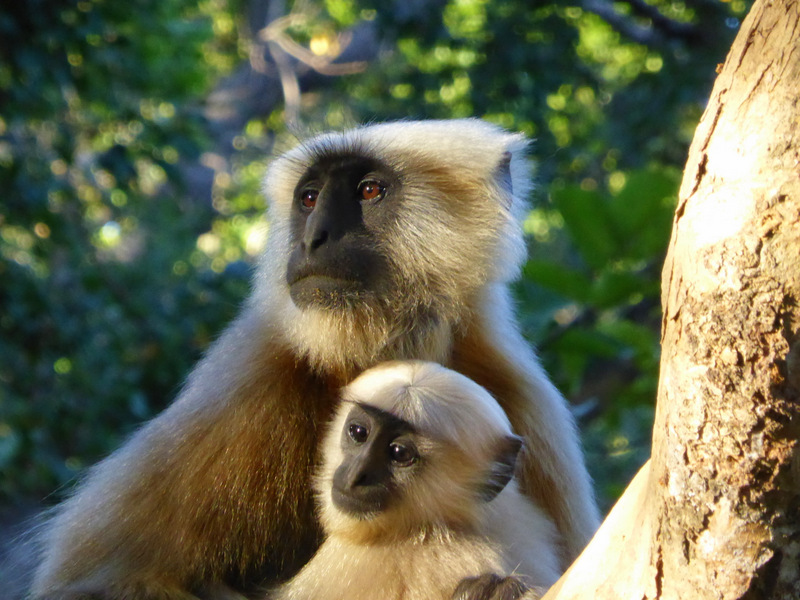 Langurs travel in large troops that often associate with herds of chital. This mama and baby are sitting in a tree just above a foraging group of chital. As we watched the scene, the langurs broke several branches with leaves off of the tree and flung them down for the chital to browse upon. The chital provide the ears and eyes for the langurs on the ground and the langurs have the aerial view, from the trees. 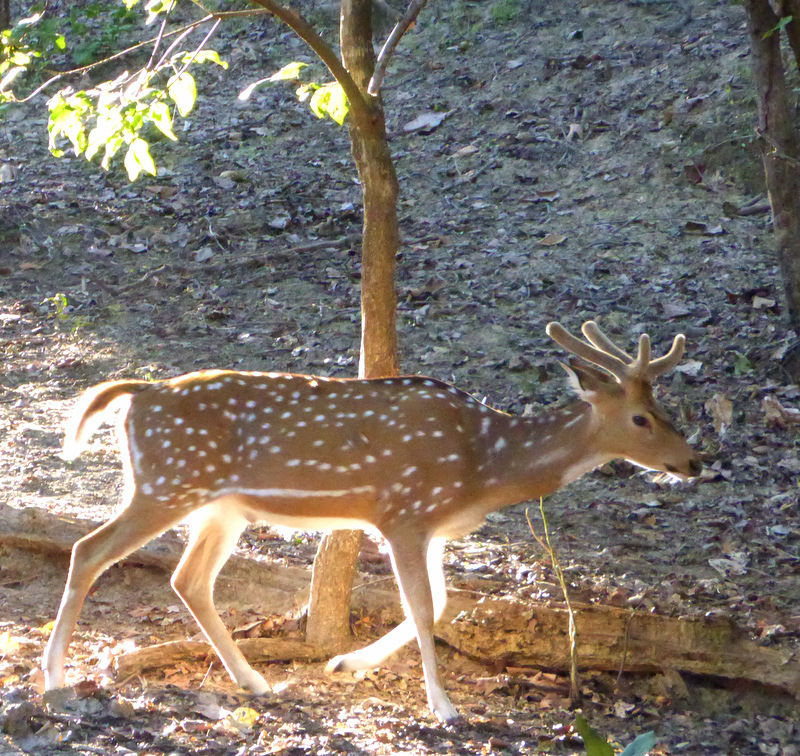 The chital have a keen sense of smell, allowing them to detect an approaching tiger long before the langurs might notice the tiger’s movement in the underbrush. But langurs can howl like banshees, when the tiger has been spotted. Our naturalist guides were also keenly observing the birds as tiger sentries. Birds issuing alarm calls would be a clue that could be used to spot a tiger. 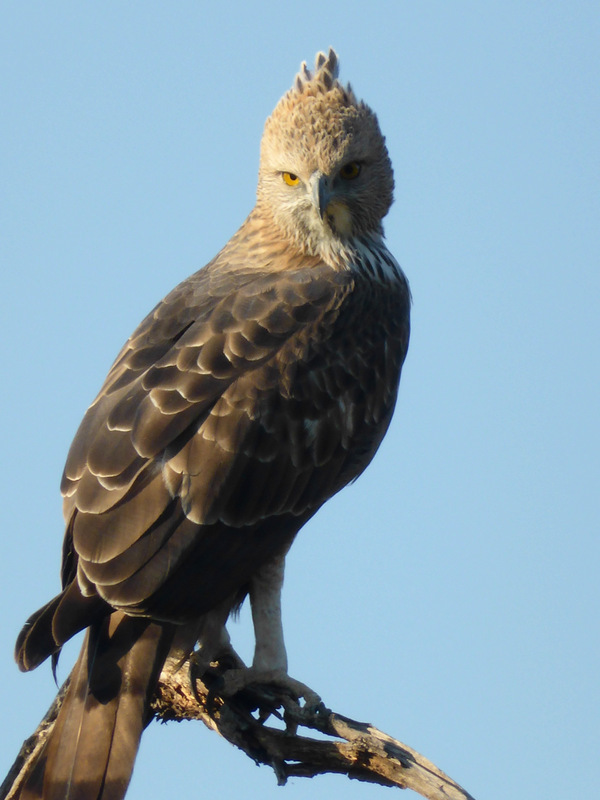 This crested hawk eagle had an excellent high perch on a dry riverbed in Corbett. 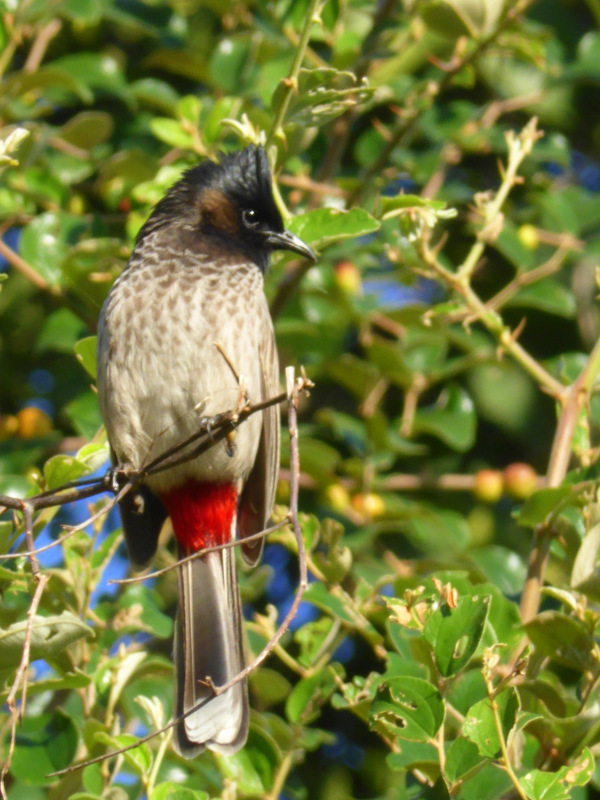 But even smaller birds, like this red-vented bulbul, could be counted on to fly up and shriek in response to a tiger’s movement through an area. We never saw a tiger at Corbett but found the park teeming with bird and other animal life, especially compared with other areas of Uttarkhand, and we were enchanted by the rustic Tiger Camp on the Kosi River. Why no tigers? Well, they’d be hard to spot in the forest. The best tiger spotting happens in the open, grasslands of Ranthambore, not forests. But I also wondered about the controversy over tigers. Some 200,000 people have been relocated in order to protect tigers in India. One Indian tiger reserve was discovered to have been completely poached of tigers, in 2011. In the US, it seems we constantly hear about the Chinese market for tiger parts, driving the poaching, but I was less cognizant of the magnitude of the ongoing tiger-human conflicts in India. A few days before we arrived in Corbett, two women, described by one of our guides as “forest people” were attacked at the edge of the park while gathering leaves for their livestock; they remained hospitalized while we were at Corbett. A couple of weeks before that attack, two young men training for the army were attacked while jogging on a road near the park. One was killed and the other badly maimed, surviving only because an oncoming bus blew its ear-splitting air horn, scaring the tiger away from its victims. 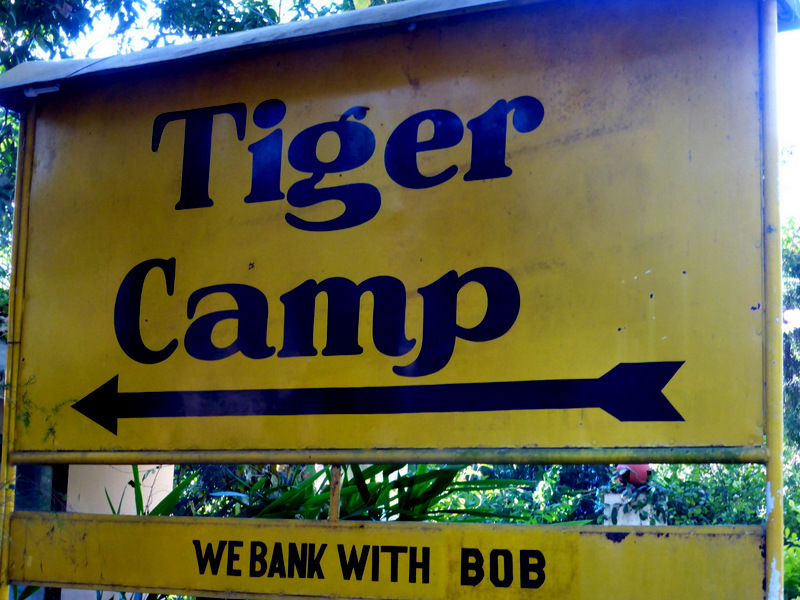 Just in the vicinity of the Corbett Park, 30 – 40 people are attacked (many do not survive) each year by tigers. The national icon seems to require inviolate habitat, living apart from humans to avoid the conflicts–conflicts that lead to human suffering, resentment and perhaps even revenge. How the Indian pursuit of saving this icon will play out in the face of the burgeoning human population size, widespread poverty, severe levels of deforestation, and vastly complex politics is a drama unfolding. This entry was posted in Fauna of India, Travel, Uncategorized and tagged Chital, Corbett National Park, Corbett Tiger Reserve, India, Kosi River, Kumaon, Rajaji National Park, Tiger, Tiger Project, Wildlife Institute of India, World Wildlife Fund. Bookmark the permalink.